A large but plain crowd assembled for the opening of the first exhibition by world renowned German photographer Andreas Gursky at the National Gallery of Victoria in St Kilda Road, Melbourne. After some lively conversation with friends and following the opening speeches we wandered into a large clean gallery space with minimal design elements. The use of space within the gallery allowed the work to speak for itself. It is a minimal hang and the exhibition works all the better for this. 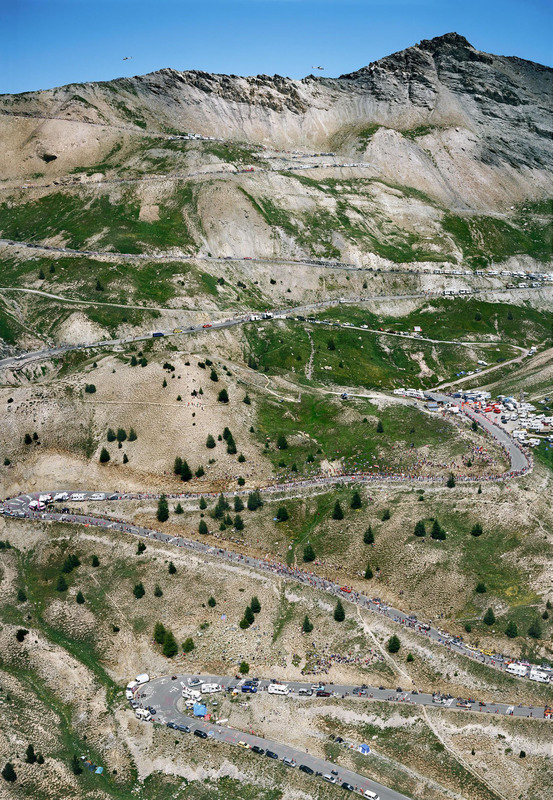 As for the work itself 21 large photographs are presented ranging from landscapes to buildings, race tracks to formula 1 pits, Madonna concerts to the Tour de France. Most work successfully in building a hyperreal vision of the world. We are not sure what is ‘real’ or hyperreal, what is a straight photograph or what has been digitally manipulated and woven together. The colour and sharpness of the images is often intensified: in reproductions of the famous photograph of the 99c supermarket in America the colours seem flat but ‘in the flesh’ the colours are almost fluoro in their saturation and brightness. Having said that the photographs are nearly always unemotional – as though seen from above in the third person, they observe with detachment. The intrigue for the viewer is in the detail, in working out what is going on, but these are not passionate photographs on the surface. It is beneath the surface that the photographs have their psychological effect: the best of the images work on the subconscious of the viewer. Like a fantastical dance the three very wide images of the Formula 1 pits feature pit crews practicing tyre changes, frozen in a choreographed ballet. People in the galleries above stare down; pit lane girls seem to have been inserted digitally into the images, standing at side or behind the pit crews in a seemingly surreal comment on these worlds. These are theatrical tableaux vivant, splashed with teams colours. Fantastic photographs. 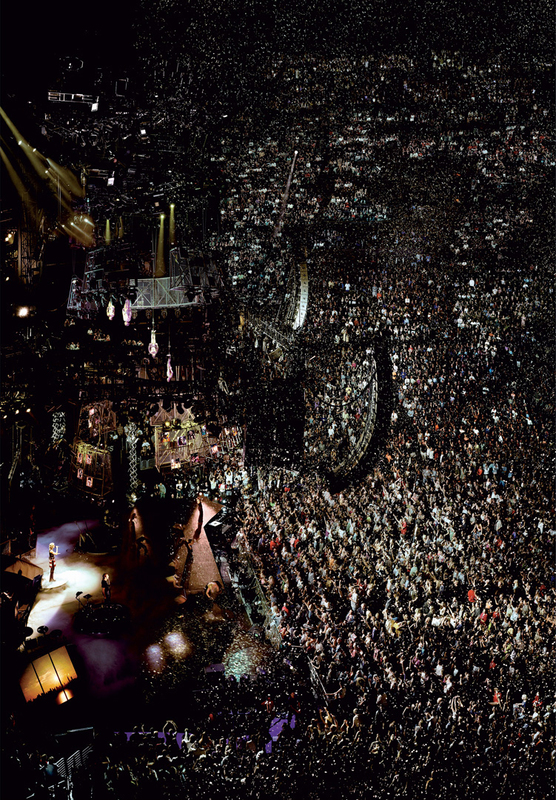 In some of the images, such as the Madonna concert or the photograph of the Bahrain Formula 1 racetrack, space seems to have folded in on itself and the viewer is unsure of the structure of the image and of their vantage point in looking at them. 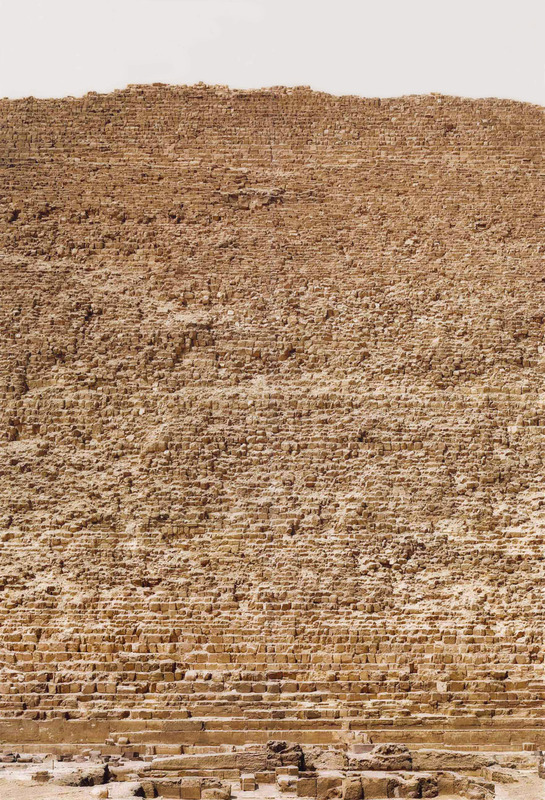 Space also collapses in the photograph of the pyramid of Cheops (2006, below), where the depth of field from foreground to background of the image is negligible. Less successful are images of a Jackson Pollock painting and a green grass bank with running river (Rhein II 1996, below), intensified beyond belief so that the river seems almost to be made of liquid silver. A wonderful exhibition in many aspects, well worth a visit to see one the worlds best photographers at work. The photographs tell detached but psychologically emotional stories about what human beings are doing to the world in which they live. These images are a commentary on the state of this relationship – images of repetition, pattern, construction, use, abuse and fantasy woven into hyperreal visions of an unnatural world. Many thankx to the National Gallery of Victoria for inviting me to the opening and for allowing me to publish the photographs in the posting. Please click on the photographs for a larger version of the image. 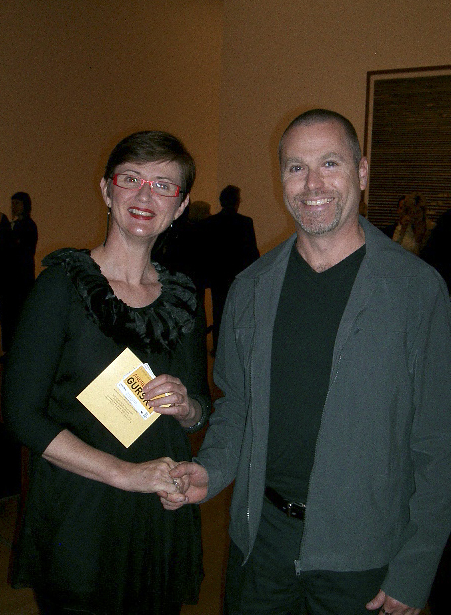 Dr Isobel Crombie, Senior Curator of Photography at the National Gallery of Victoria with sculptor Fredrick White at the opening of the Andreas Gursky exhibition at NGV International, Melbourne. For the first time in Australia, an exhibition by German contemporary photographer Andreas Gursky opened at the National Gallery of Victoria. From the Haus der Kunst in Munich, Andreas Gursky presents 21 major works for which the artist is internationally acclaimed. The photographs range from 1989 to 2007 and include seminal works such as Tokyo Stock Exchange and the diptych 99 cent store. 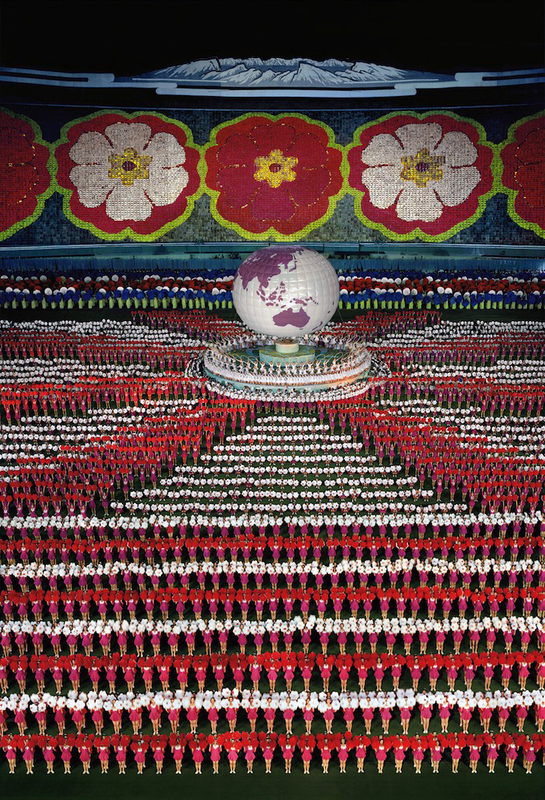 Andreas Gursky is recognised as one of the world’s leading contemporary artists. On view through 22 February, 2009. Well known for his large-scale (generally measuring an astounding four to five metres) and extraordinarily detailed photographs of contemporary life, Gursky continues the lineage of ‘new objectivity’ in German photography which was brought to contemporary attention by Bernd and Hilla Becher. 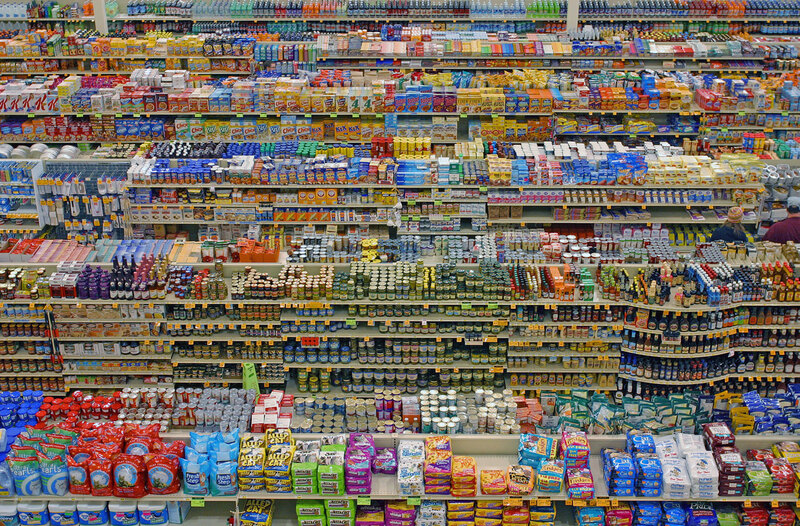 In the 1990s, Gursky became inspired by the various manifestations of global capitalism. 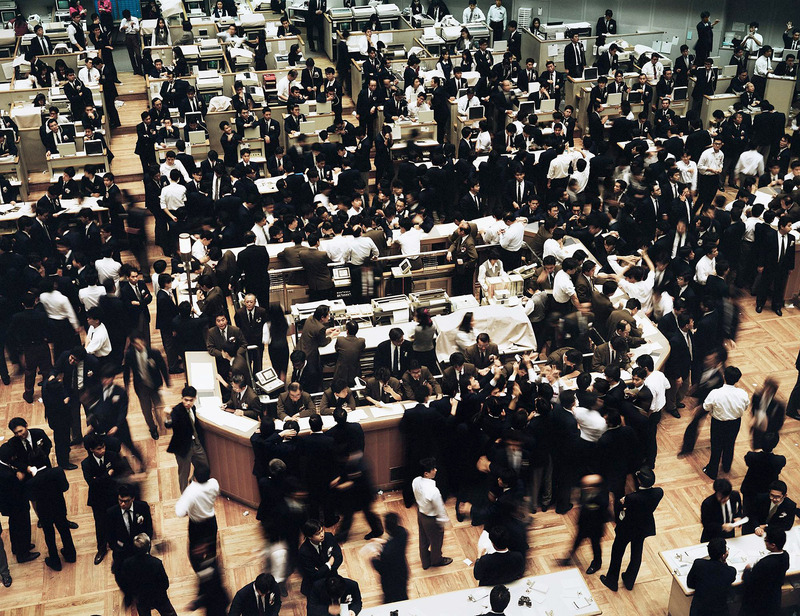 His interest was piqued looking at a newspaper photograph of the crowded floor of the Tokyo Stock Exchange and he began to photograph its flurry of suited traders, somehow moving according to some inbuilt order. 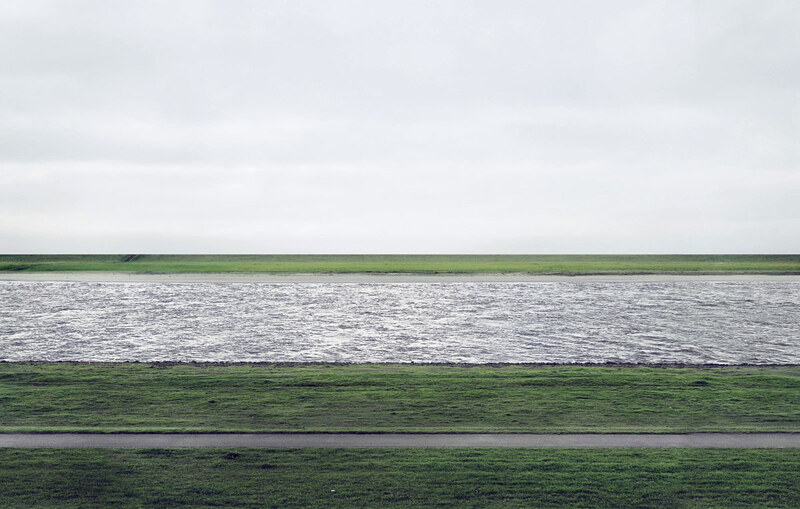 Andreas Gursky was born in 1955 and grew up in Düsseldorf, Germany. In the early 1980s, he studied at the Kunstakademie Düsseldorf, Germany’s State Art Academy. Whilst there he was heavily influenced by his teachers Bernd and Hilla Becher, who were well known for their methodical black and white photographs of industrial machinery. 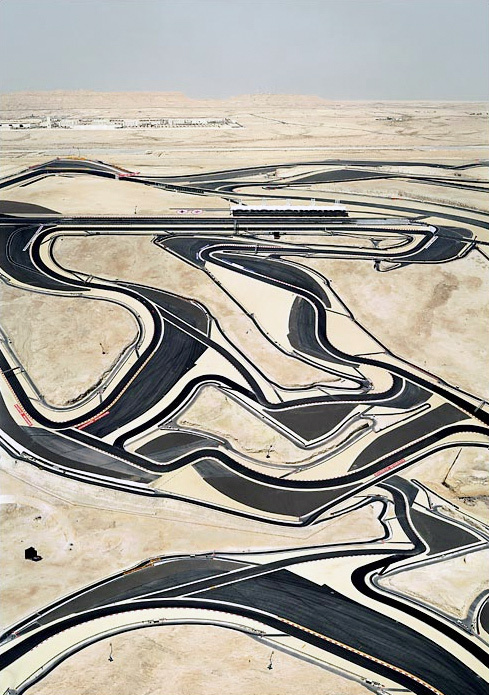 In 1984 Gursky began to move away from the Becher style, choosing instead to work in colour. Since then he has travelled across the world to cities such as Tokyo, Cairo, Hong Kong, Stockholm, Singapore and Los Angeles photographing factories, hotels and office buildings – places he considered to be symbols of contemporary culture. 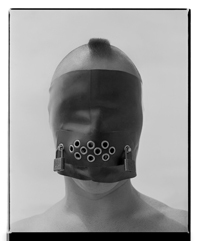 His world-view photographs during this period are considered amongst the most original achievements in contemporary photography. Gursky has been the subject of numerous international exhibitions including the Internationale Foto-Triennale in Esslingen, Germany in 1989 and 1995, the Venice Biennale in 1990, and the Biennale of Sydney in 1996 and 2000. 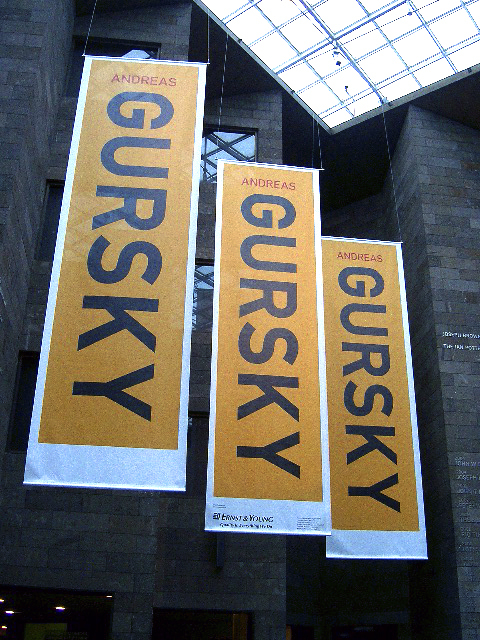 In 2001, Gursky was the subject of an exhibition at the Museum of Modern Art in New York.